The NE CSC’s Graduate and Postdoctoral Fellows are actively engaged in research that provides scientific information and tools that natural resource managers can use to aid climate adaptation in the Northeast region. What are they working on and who will benefit from their research? Watch the video! The Department of Interior’s Northeast Climate Science Center (NE CSC) provides scientific information and tools that natural resource managers can use to aid climate adaptation in the Northeast region. The Department of the Interior and the U.S. Geological Survey have made it a priority to train the next generation of scientists and resource managers. The Climate Science Centers and consortium institutions are working to contribute to this initiative by supporting and building a network of students across the U.S. interested in the climate sciences and climate adaptation. The NE CSC’s Graduate and Postdoctoral Fellows are actively engaged in research to meet natural resource manager’s needs. 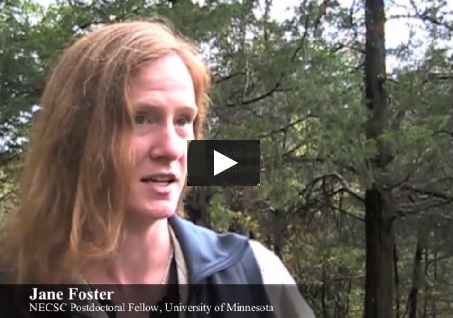 This video was recorded during the 2nd Annual NE CSC Fellows Retreat in October 2014 at Reis Biological Station near Steelville, MO. Twenty-two graduate student and postdoctoral fellows from six NE CSC partner institutions gathered to share their research, meet with natural resource managers, develop interdisciplinary connections and collaborations, and learn about climate impacts to the Central Hardwoods forest ecosystem.